Totally unique and guaranteed to make everyone laugh, this Blindfolded 4x4 driving birthday party in beautiful Nottingham is the perfect way to kick off your birthday celebrations! Your are guaranteed beautiful scenes and stunning forests with any Nottingham birthday party idea, and this is no exception. If you’re looking for a thrilling experience that has an element of friendly competition, blindfold 4x4 driving is perfect for you! This 4x4 driving is an experience like no other as you are completely in control of a 3 and a half ton, heavy duty vehicle with absolutely no sight! Throughout your time driving you will be solely guided by your birthday group who will give you instructions about directions and obstacles around the track in Nottingham. This makes for a light hearted and funny birthday party activity, as well as tests the trust between friends and family. All of the tracks are off road and have both difficult and easy parts so you can really get the most out of the session and vehicle. The whole activity lasts about an hour, giving you enough time to go through a safety brief and everyone in your birthday group have a go behind the wheel and guiding each other. Whether you’re driving or directing, this birthday party is a really fun and completely unique experience for all. There will be an event supervisor with you in the vehicle and before you start to give you some tips, as well as provide you with all the equipment you need for the activity. If you’re looking for something totally stress free and a bit different for your birthday, a blindfold 4x4 driving might be just what you need! Even if you have younger members of the birthday party attending, they can still join in directing you around the track so that everyone is involved on your special day. 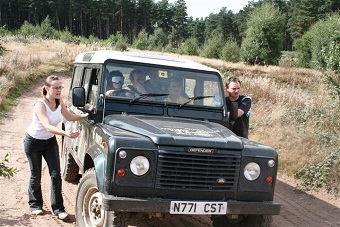 Let our events planners help you organise a day to remember with this blindfold 4x4 driving birthday party in Nottingham or just give you some more information and call us on 0161 341 0052.